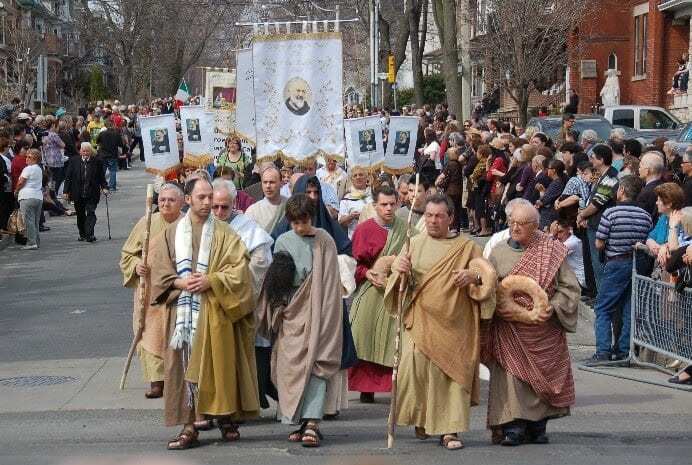 The Holy Sepulchre at a Good Friday procession. Christmas has developed into an event that has much to do with commerce but very little concerning religion and religious aspects. Thankfully, Easter has not and is not currently going the same way in Malta and Gozo – fittingly enough because this after all is the main highlight, the raison d’etre of Christianity. 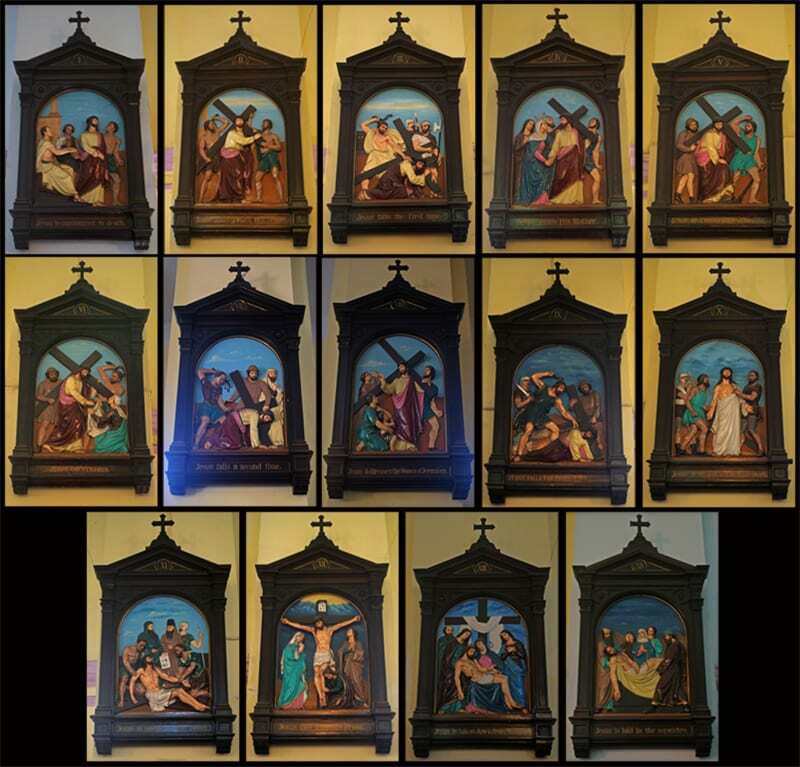 The 14 Stations of the Cross. Naturally there have been changes and developments since my childhood many moons ago but the solemnity and traditions have remained very much the same but have now become more prominent and more sophisticated aligned to affluence and the need to appeal to the different generations. This year we are due for an early Easter, something to do with the moon re-appearing, or disappearing, or something like that, but there is still the traditional 40 days of Lent starting with Shrove Tuesday, Ash Wednesday and culminating in a Holy Week that in Malta starts off with Our Lady of Sorrows and then incorporates Maundy Thursday, Good Friday and then Easter Sunday, all with their independent manifestations, displays, commemorations and celebrations – all steeped in traditions that go back hundreds of years. The Valletta Our Lady of Sorrows procession. Shrove Tuesday has no great significance except to mark the last day of the wonton Carnival period which today is less wonton but more commercial because you can let your hair down and be blase’ at any time of the year and not during a particular period. Less traditional too is Ash Wednesday from the days of my boyhood when the regime then was a 40-day period of fasting and abstinence strictly observed by the majority. Fasting and abstinence (from consuming meat that is) were unavoidable par for the course restrictions not on the rigorous Islamic pattern for their Ramadan but forbidding any consumption during meals except for water and gallons of black, unsweetened coffee. These were generally observed by most adults, some going further by banning the consumption of all meat during the whole of Lent as well as the banning of sugar products. Those with grave sins to dispense with (mostly men!) also gave up smoking. Valletta Oratory Last Supper display. Good Friday was a day of doldrums. Any kind of entertainment was strictly forbidden – that is cinemas and dance halls closed down (no televisions or night clubs then), all shops were closed, fasting and abstinence was strictly imposed on all the household, cable radio only played solemn music and staged crucifixion plays and most households draped black cloth across their front doors and kept them half closed too as a sign of mourning. Three ‘o clock in the afternoon was the fatal hour of total silence, the time traditionally believed to have been the ‘exact’ time when Jesus Christ expired on the Cross on Calvary Hill. Any kind of merriment including loud or raucous laughter was seen to be ‘sinful’ and smoking in public deemed heretical. All that has now changed of course with solemnity restricted to the most fervent households or around Church activities but for cinemas, discos, bars, clubs and restaurants it’s business as usual. 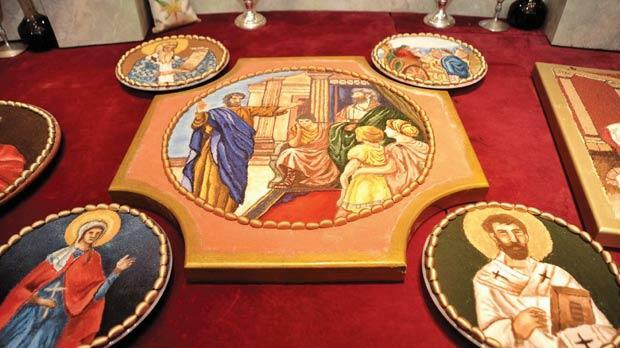 Table frescoes made from rice at Zebbug. 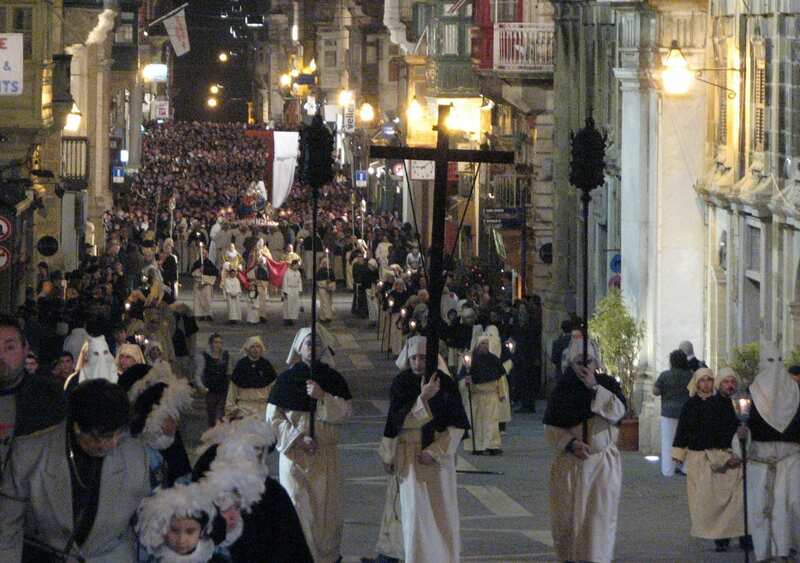 Religious solemnity begins on the Friday before Good Friday with the commemoration of Our Lady of Sorrows and a major procession in Valletta attracting many thousands. It is a day for making vows for mainly impossible causes or expressing thanks for vows fulfilled but overall meant to express the sorrows suffered by Our Lady (as a mother) for her child (i.e. Jesus Christ) for the pain she endured during his crucifixion. Frescoes made from salt in Cospicua. Maundy Thursday is a major event with symbolic feet-washing ceremonies throughout all churches and prayers during the Stations of the Cross, a church walk around the 14 tableaus that depict the whole process of Christ’s trial and crucifixion, events that also draw thousands of faithful in mainly hushed reverence. 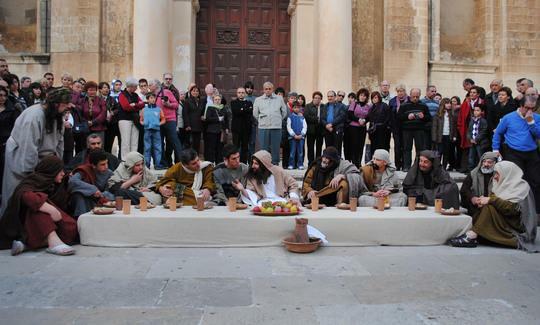 Live enactment of feet washing ritual and Last Supper display at St John’s Cathedral, Valletta. 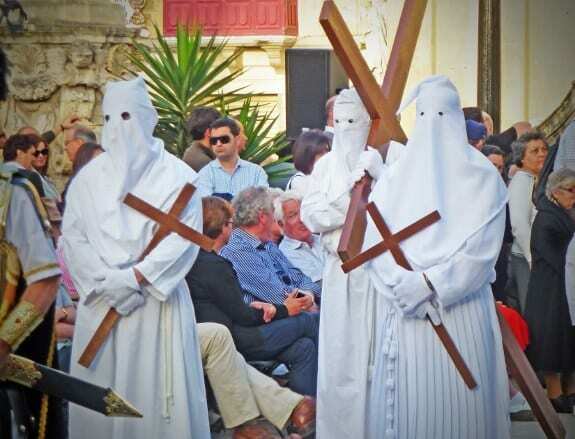 Between Thursday evening and mid-morning Friday there are two events that I find mainly associated with Malta although there may be similar manifestations in Spain, Italy and Sicily – where most of Malta’s religious traditions originated from. The first is Last Supper exhibitions which gained popularity in mid-18th Century and never looked back and which are extremely delicate, artistic and a source of great fascination the two main ones held at the Oratory of St Dominic’s Church in Valletta and at The Domus in Cospicua but also throughout other localities such as Zebbug and Lija. 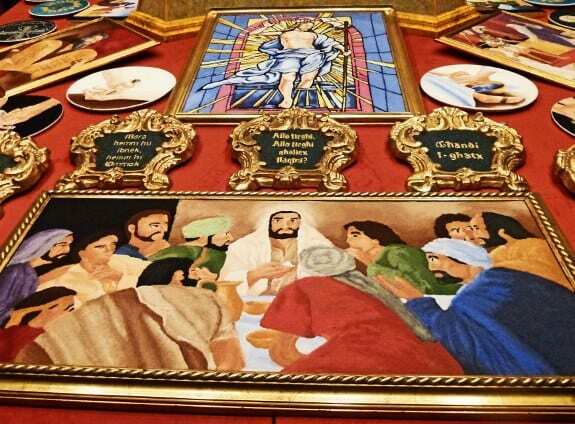 These commemorate Christ’s last supper but commemorate it with artistic colour and passion. 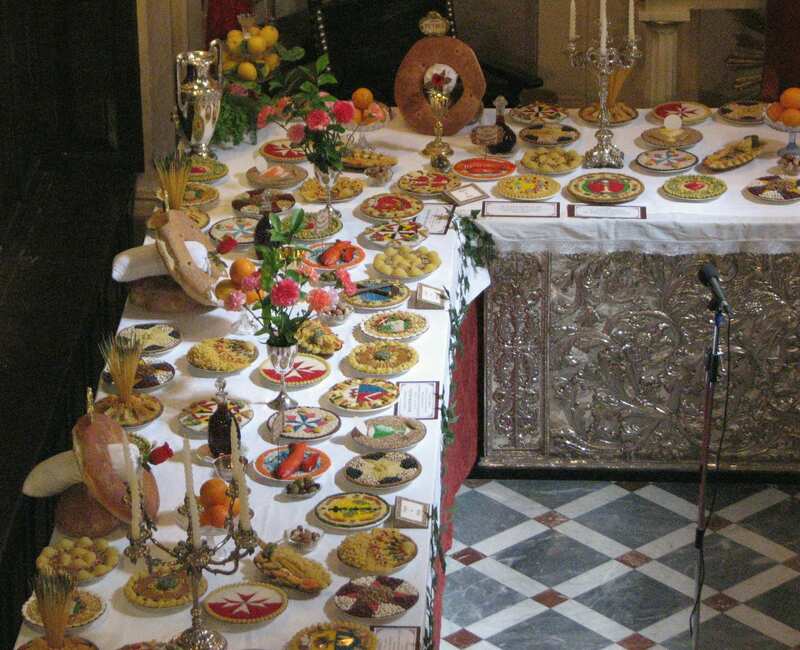 Tables are laid out with flagons of wine and water, bread, and plates decorated with intricate frescoes made from coloured rice, or salt or pasta shells commemorating symbolic icons such as fish, lambs (highly associated with Easter), crosses and Maltese Crosses. 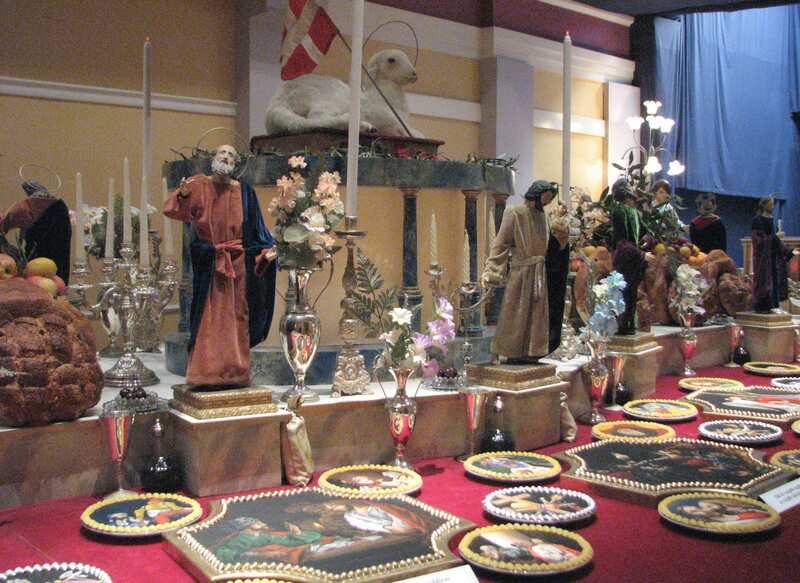 Holy Week display at Zebbug. These are mathematically precise and involve hours of preparation and work. Bread is a main symbol (i.e. communion) and some localities specialise in less artistry and greater historical fact with displays of herbs and foodstuffs that would have been popular in Judea during Christ’s time. After visiting an exhibition families commence en masse in reciting prayers in seven different churches or chapels, mainly on foot in the past but nowadays with many opting to drive to different localities throughout Malta and Gozo to make an evening of it. A whole range of foodstuffs are naturally on sale such as anchovy pies, ricotta pies and bread preparations. Sweetmeats are mainly made of carob syrup and the highly popular Quaresimal, a baked, crusty and crispy mixture of ground almonds, flour, cinnamon, rose water, lemon rind and a small amount of sugar. The mixture is kneaded in small one centimetre thick flans and baked. Penitents and those who have made vows. 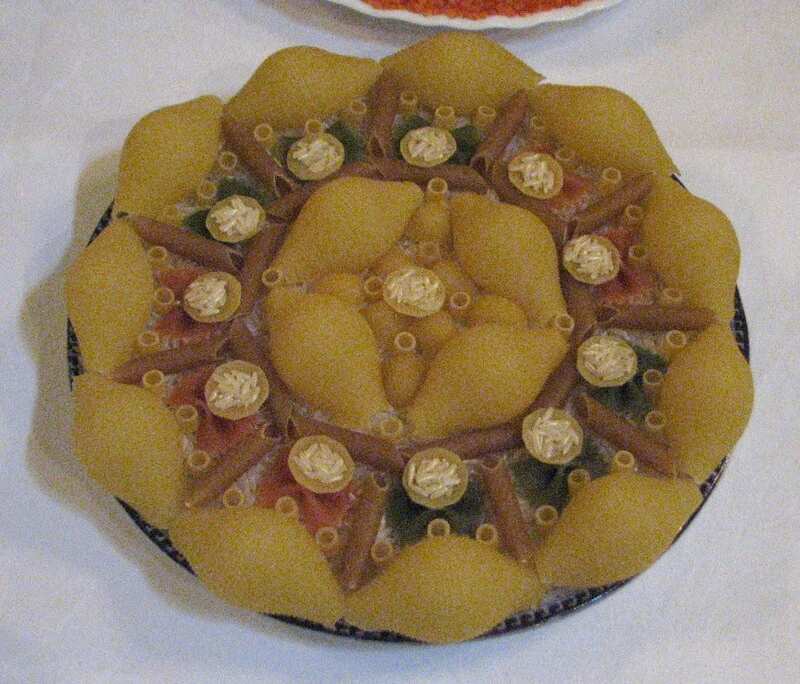 Despite all trhe culinary restrictions, this being the Mediterranean, food is never far away with a number of traditional savouries and sweetmeats. “Pennite” are pencil-shaped sticks of rice paper and melted sugar (quite sickeningly sweet) wrapped in silver or coloured foil and for those fasting, “Karamelli” are popular, boiled carob fruit sweets. The Apostle’s Loaf is also highly popular, a large circular loaf about 16 inches in diameter with a hole in the middle (Polo-sweets like! ), decked with sesame seeds. Most macabre are Lenten Bones, baked marzipan confections in the shape of real bones. 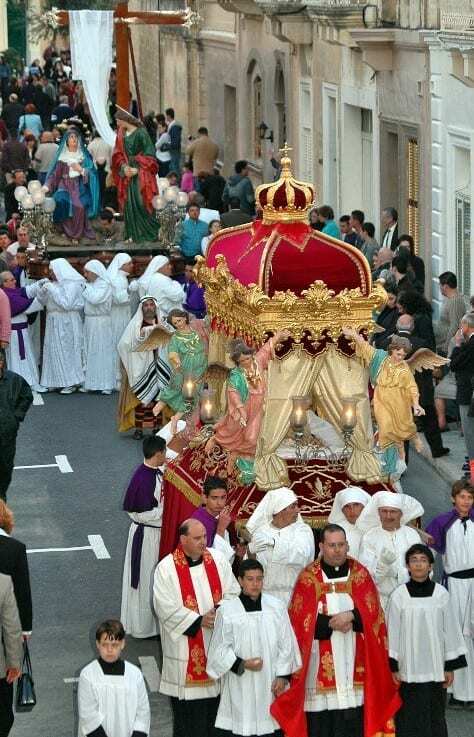 However, the greatest crowd pullers are the Good Friday processions in most localities, the main ones in Mosta, Valletta, Qormi, Zebbug, Cospicia, Zejtun, Naxxar and of course Victoria and Xaghra in Gozo, but in many other localities throughout the two islands. Much paegantry at Good Friday processions. 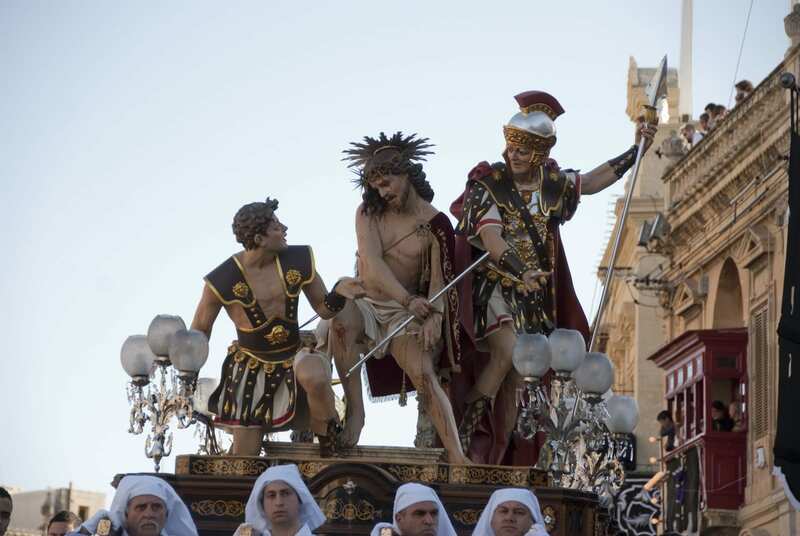 The traditional origin was that of carrying in procession seven large statues depicting the passion and crucifixion of Jesus Christ accompanied by the recital of prayers and the local brass band playing funeral marches. At the back of each procession would be a number of hooded penitents (Ku Klux Klan style) or those who have made various vows, barefooted, clothed and hooded in white (for anonymity) and carrying either an effigy of the Cross or dragging weighty iron chains strapped around their bare ankles – or both, depending on the vow. At one stage this began to go over the top and legislation had to be passed specifying the length and weight of chains that could be dragged. 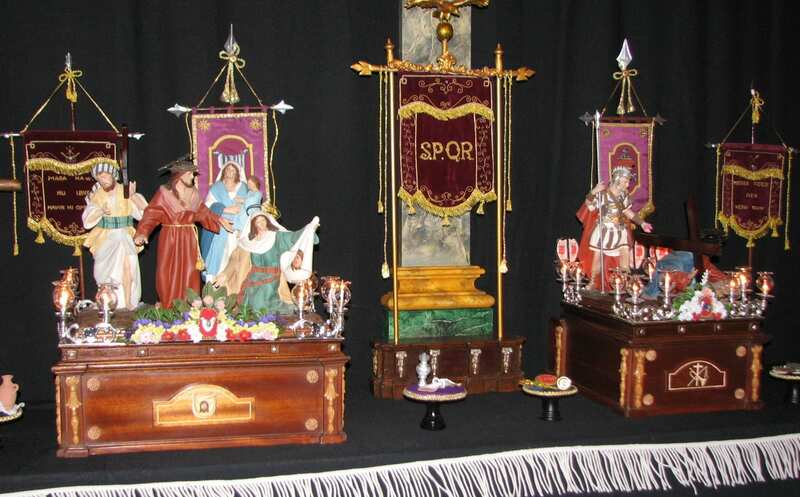 Such manifestations are very much in the Sicilian and Spanish tradition but over the years massive additions were incorporated depicting biblical themes in colourful displays and with hundreds of people participating wearing costumes of Roman soldiers, the Apostles, Pharisees and Old Testament figures like Noah, Moses and Job. The most sombre is held in Valletta, the more colourful in Qormi, Zebbug, Cospicua, Naxxar and Zejtun and Xaghra in Gozo. In Zebbug there is also a superb Madame Tussauds style waxworks exhibition of those present at the Last Supper based on Leonardo Da Vinci’s famous painting, the figures so lifelike you actually feel like talking to them! Zebbug also has the famous wooden rattle on the church spire, a continually eerie and monotonous funeral dirge that makes you want to scream out loud! Easter Morning is a complete transition with church bells peeling crazily all over Malta and Gozo and a number of parishes are famed for joyful and boisterous processions headed by a statue of the Risen Christ as brass bands play triumphal marches. Enormous flags drape every available flagpole. One particular tradition is that of running with the statue (particularly in Cospicua, Vittoriosa and Qormi) depicting a triumphant resurrection to life and to being alive in general. 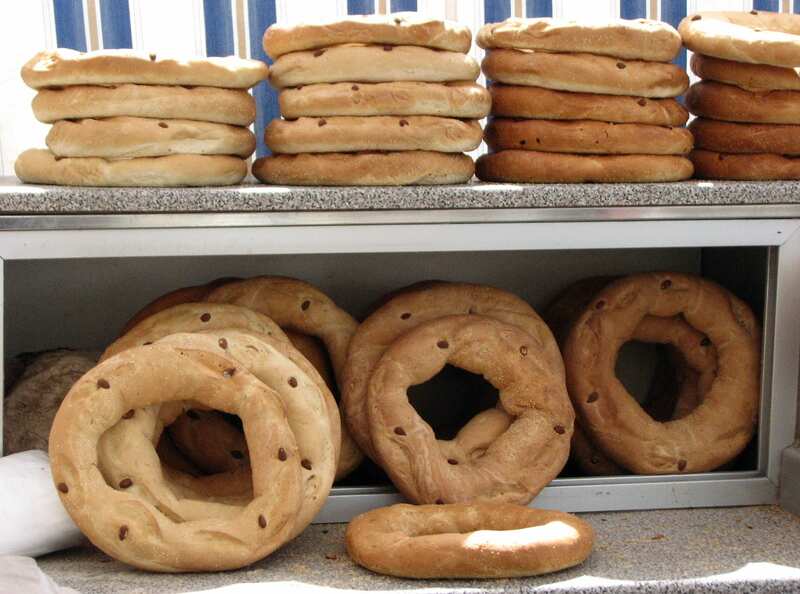 This is the long-awaited day when children (and adults) are allowed to eat their “figolla” which every child expected to receive from parents and close family relatives on Easter Morning. This was a 12 inch baked marzipan confection infused with a hint of lemon zest, highly decorated with brightly coloured icing sugar, in the shape of a woman for the girls and a man for the boys. Strangely enough the face was a cardboard print of a woman or a man plonked on the neck. Other favoured shapes are a fish, a rabbit or a heart for a sweetheart. Yes, there is still a strong commercial element and much revolves around savouring and eating goodies but there is also very marked reverence and reflection and all the hundreds of participants in organisations and processions do so willingly and with fervour.